I'm a big fan of the art books by Andrew Loomis. 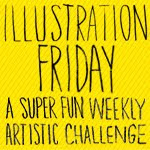 Every time I read "Creative Illustration" I find something new and I often think: "Why didn't anyone show me this before?" Another problem came up while fixing the drawing. The paper doesn't absorb the fixative very well and the charcoal started running. I quickly laid the drawing on the floor to let it dry. Lesson learned: It's better to spray on three or more very light coatings than one.